HVAC Tech vs. Auto Mechanic: Which Should You Pursue? If you have a talent for mechanics, for fixing things, for working with your hands and other tools, you should consider a career in a mechanical field. But there are many different paths that you can take. Two mechanical careers that are growing and which offer stability, advancement, and good pay are careers as an HVAC technician and an auto mechanic. Read on to learn more about these promising careers; what they do, what they pay, and what you have to do to get there. What is an HVAC Tech? HVAC is an abbreviation for heating, ventilation, and air conditioning. These technicians work in various indoor and outdoor environments in order to help maintain and install the equipment that heat and cool spaces appropriately. However, the job also requires excellent communication skills for interacting with customers on a daily basis. Working as an HVAC technician is a labor-intensive job that can sometimes be dangerous and uncomfortable, so safety knowledge is essential. For example, techs could find themselves working in cramped spaces, spaces with little or no ventilation, or in buildings with extreme heat or no heat. The chemicals used in cooling systems are hazardous and can cause injury if proper precautions are not taken. Also, HVAC techs may need to work irregular hours in case a customer has a heating or cooling emergency. Technicians need formal HVAC training, usually in the form of classroom training that may or may not include an apprenticeship. Classroom training can be done either in a trade school, technical school, or community college and can include a two-year, full-time associate degree program. The EPA requires HVAC techs to receive their Section 608 certification in order to acquire the proper licensing to work as a professional HVAC tech. From here, HVAC techs can work their way up to a managerial position or a career in sales and marketing. As you can see, there is a substantial need 1 for HVAC technicians, and the potential pay for these positions is good. Auto mechanics are responsible for a wide range of automobile services. From performing routine maintenance, such as oil changes and replacing filters to more intensive projects, such as replacing a carburetor and everything in between, quality auto mechanics are in demand to keep America’s drivers safely on the move. 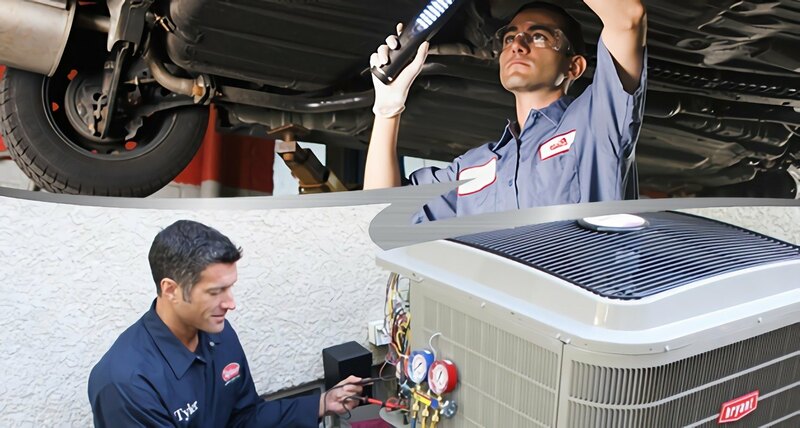 Not unlike HVAC techs, working as an auto mechanic is a labor-intensive job that sometimes requires working in uncomfortable conditions and during irregular hours, such as evenings and weekends. And they get dirty from working with oil and grease. To be a great auto mechanic, however, more than just mechanical skills are needed; auto mechanics also have to deal with customers on a daily basis, therefore, excellent communication skills are a must. Employers looking for quality auto mechanics will prefer a high school education and formal training at a vocational or other post secondary school that includes on-the-job training. Entry-level careers in the auto mechanic industry may begin with a trainee position and evolve into overtime to include more responsibility and higher pay. Auto mechanics can also strive to earn industry certifications to further their career. The pay for auto mechanics 2 is solid, and the future job prospects are good.